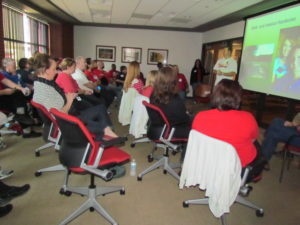 St. Louis Area Bloggers Learn How @MOFarmersCare #STL - JP loves LIFE! I love baseball. Its always been a sport I enjoyed. Spending an afternoon or evening at the ballpark is perfect. What makes it a tiny bit better? Meeting a bunch of bloggers and farmers at a ballpark! That’s exactly what happened last month when I got to go to a bloggers event sponsored by Missouri Farmers Care. 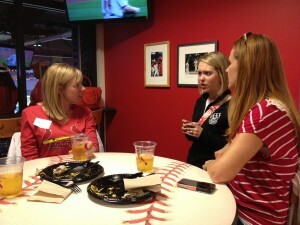 It was a great followup to the visit to Busch Stadium with America’s farm moms. Jim Fisher — Hog Farmer, Middletown, Mo. Kate Geppert — Dairy Farmer, Columbia, Mo. Mike Geske — Corn Farmer, Matthews, Mo. Matt Hardecke — Cattle Farmer Cattle Farmer, Ballwin, Mo. This was a new opportunity for me. What happens when you get a bunch of bloggers and farmers in the room together when the bloggers don’t farm and the farmers don’t blog? I’m used to being around a bunch of farmer bloggers, but this was a bit different. And it was SPECTACULAR! Farmers know ins and outs of producing the crops and raising the livestock on their farms. Bloggers know the ins and outs of how to combine photos & words their readers will enjoy. Both appreciate hearing another person’s perspective and getting a chance to ask questions. The event focused on each of the farmers being able to present information about their farms, the food they produce and other areas of agriculture. So much of what they said was familiar to me (lucky to know a bunch of farmers already) but it sounded new because the audience I was in and the interest I was getting from them. How many people does one farmer feed? One of the slides that really grabbed our attention was one that talked about food production on farms and the changes in productivity in one generation’s time. 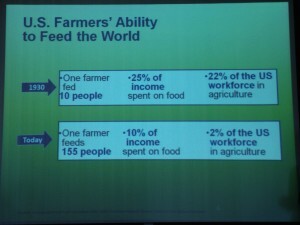 The slide said that in 1930 a farmer fed 10 people, Americans’ spent 25% of our income on food and 22% of the US workforce was employed in agriculture. Today (it pointed out) that a farmer produces food for 155 people, we spend an average of 10% of our income on food and just 2% of America is engaged in agriculture. Wow. It set the tone as each of the farmers talked about how their ancestors came to America and how they found their way to a farm in Missouri over time. They talked about how their families over time moved from producing food for them and a couple of others in their community to producing more food of a specific type for a market that helps feed lots of people. Whether the farmers were producing beef, milk, pork, corn, cotton, etc. all of them showed a great sense of history and humble pride in what their families have built over generations. It’s something that is common with businesses that have started very small and has grown to do more. They talked about how they choose how to farm and how much they appreciate that their choices may not work for everyone. I should say here, I regret not taking notes because there was a lot of discussion. There were questions back and forth. One of the bloggers who was there had heard a lot of people talking about GMOs and wondered if the farmers had many people asking him questions about them. She also wondered if they used them. The farmer who took her question said he has seen things in the popular press, but the conversation he participates is very different. He said in his farm community, everyone sees the benefits of biotech — in the environment, in the ability to manage pests more efficiently, in yields and more. That’s obviously not heard everywhere and the farmer said it’s one of the many reasons more farmers are active online, are getting efforts in place to connect to more of their urban neighbors. He pointed out that Missouri farmers truly do care about the people who eat the food they produce. That night, we all enjoyed typical baseball fare — hotdogs, nachos, etc. But our minds were on dairy farms, cattle ranches, hog farms and in corn, soybean and cotton farms. Sadly a fall cold took Robyn Wright of Robyn’s Online World out of the event. It sounded dreadful and though we really missed having her there, we appreciated her not sharing the germs! How can folks who weren’t there have the opportunity to interact with some of these same great farmers and others like them? Missouri Farmers Care has a lot of farmers connecting through its website (linked) on topics like “why I farm” and recipes. They are on Twitter, Facebook and YouTube. The organization is funded through contributions of various farm-based organizations and companies in the state. Missouri Beef Council represents cattlemen and has a website MoBeef.org and blog: BeefBites.org. The organization also is active on Twitter, Facebook, YouTube and Pinterest. Midwest Dairy is an organization that works with farmers in several Midwestern states and they provide great information on recipes, nutrition, etc. The organization also is active on Twitter, Facebook and YouTube. Missouri Pork Association has some pork recipes on its site. The Missouri Soybean Association is active on Twitter, Facebook and YouTube. This sounds like so much fun and a great learning experience! I am always looking for events like these to attend, but unfortunately I always find out about them after they have already happened:( How do you find out about all these events/conferences that you have attended? I’ve been growing my online network for several years so it may be the difference in time put in, may be the difference in having moved to St. Louis last year with a real focus on needing to meet people not from work so I very specifically decided to find other bloggers in this area & connect with them. Would be glad to throw around ideas with you if you’d like.